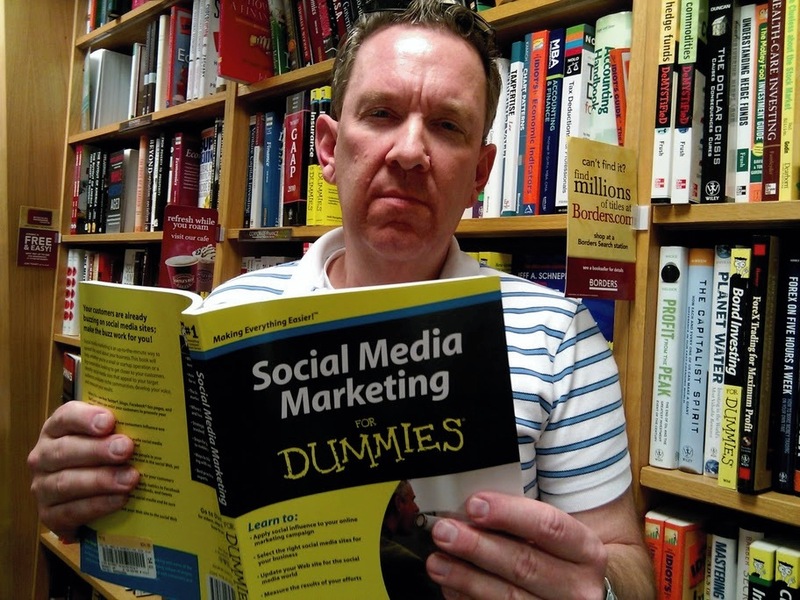 Facebook, Twitter and Blogging – business time wasters or money makers? 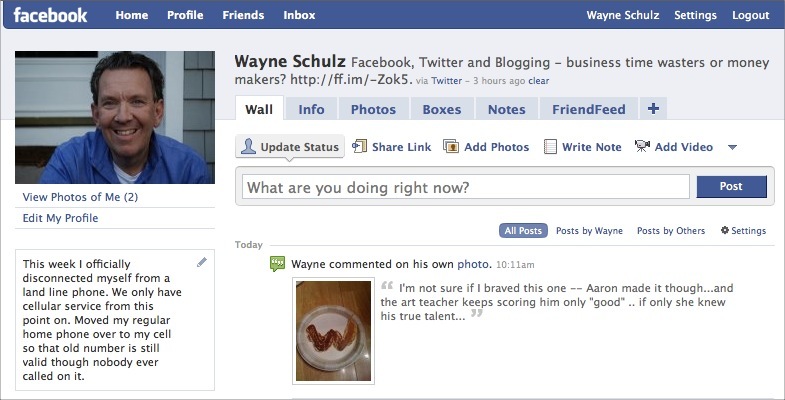 You are here: Home / Technology / Uncategorized / schulz consulting / Facebook, Twitter and Blogging – business time wasters or money makers? Have you heard about the newest Internet buzzword? It’s called Social Media and depending upon who you talk about it with you’ll get a differing definition that paints it as either the next big thing or the world’s greatest waste of time. I like to think of Social Media as nothing more than a means of connecting more regularly, inexpensively and efficiently to people or businesses you might not otherwise connect to. Perhaps you’ve heard the cliche – “people like to do business with people just like them”. The use of these various Social Media tools allow you to interact with your customers and prospects on a more personal level than ever before. There are dozens of ways to be active online with Social Media – some of the popular tools are MySpace, Facebook, Twitter, LinkedIn as well as the use of blogs to self publish content. The question I hear over repeatedly from people who haven’t yet joined the online Social Media scene is – “what can I do with Social Media tools like Facebook ,etc” and “will social media help my business or is it just for high school kids”. Rather than argue that all Social Media tools are awesome and worth spending hours of work time to use – I’ll explain how I use Social Media and what I believe its long term benefits are. The goal most businesses have in mind when they think of “going online” is to increase the likelihood that their customers and prospects can easily find them in an online search. As you may have found, obtaining a much coveted high Google ranking is increasingly tougher as competitors employ professional search optimization consultants to craft pages tailored for higher search engine rankings. There are also some experts who predict that Google search will eventually become less dominant and give way to searches through other types of Social Media sites such as Twitter and Facebook. What can your company do when you lack the budget to hire an expensive search engine consultant and you lack the skill to do this search optimization yourself? My answer to search optimization has been to ignore the tricks and fine tuning of web pages. These tweaks to rank a web page highly seem to change almost daily and keeping up with the latest tricks of the search trade is almost impossible unless it is your full time job. In my use of the Internet I’ve found that one type of page never seems to go out of style. Web pages that contain useful content instead of a sales pitch are increasingly prized by those customers and prospects doing their own searches on the web. Blogging Is An Easy Way To Publish Fresh Content Online And More Helpful Content Equals More Visitors To Your Site. When people hear of blogging they sometimes think of a lone writer ranting endlessly about the local government or some other esoteric topic of interest to a small minority. At it’s core blogging means nothing more than writing an article and publishing it on the Internet. The key to blogging is that once you write and publish an article – the words in that article become indexed by Internet search engines and eventually (hopefully soon) are discoverable by potential clients who in turn may contact you. To be sure there are those types of blog web sites. However the way you use blogging for your company can also attract significant traffic to your web site. (Remember – more traffic reading quality articles equals the chance to contact more qualified web searchers). On my site – http://s-consult.com – I’ve installed a free blog software program called WordPress (http://www.wordpress.org). Because WordPress allows you to publish articles quickly and easily from any Internet connected computer it’s significantly more convenient than the old method of publishing web pages through software such as Frontpage that had to be installed to a single computer. There are also a significant number of free WordPress designs that you can download and use to customize the look of your WordPress installation. During the course of a day (depending upon my schedule and whether there is any relevant news) I may publish 1 to as many as 6 articles. Do the math and you can see that by the end of the week if I published only the minimum that I’d have 5 new web pages for the search engines to index and for customers and prospects to find. Multiply that by 52 weeks in the year – and in the first year I’d have over 260 different web pages that all would be indexed and searchable on the web. There’s a good chance that out of the 260+ pages there will be some that are indexed highly by search engines – especially when I’ve taken care to make sure that I always use relevant keywords and write about topics that deliver value to clients and prospective clients. Perhaps the best thing about blogging is that it costs nothing to start. WordPress is completely free and has numerous third party enhancements that can tailor it for use on almost any web site. I like to use this solution because I can update my site from any web browser without the need for added software. Once written the content is all properly formatted with graphics and fonts. There’s a minimum of “geek” knowledge required to create this content. Remember – the more helpful content you have on your site (emphasis on the word helpful) the more likely a web visitor is to read it and contact you. 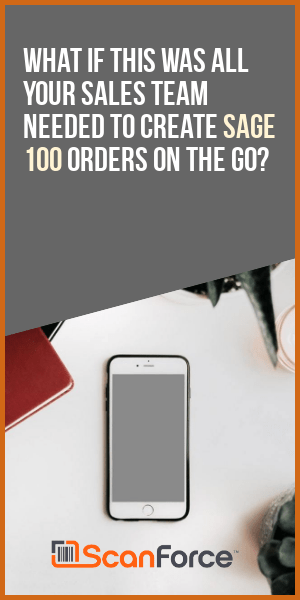 The cost of creating this helpful content is only the time you spend writing (on average it takes me about 30 minutes to generate a typical online article including proof-reading). Once created these articles on your site live on forever. Facebook is becoming a hub of information for people of all ages. If you have teenagers you’re probably very familiar with this site as it’s the place most of them gravitate toward online. The site allows for creating a profile (picture, name, address, bio) as well as sharing messages via mail and instant messaging. Over the holidays as I spoke with my teenage nieces and nephews they all told me that the way they communicate with each other is all via Facebook. None of them admitted to regularly using email. As businesses if we want to reach this next generation, we should understand the tools that they use. While most of us would head to the Google search engine to find information – increasingly we will may see clients and potential employees using sites like Facebook for search and communication. There are several ways to market on Facebook — you can create events and have people register to attend (think user groups), you can create a fan page for your firm (this sounds geeky – but remember that users of Facebook may be the staff that you’re trying to recruit – and Facebook is increasingly the area that they live within to message and do research). Think of Facebook as yet another marketing resource. Joining is free. Create a page for yourself and your firm which can help potential employees locate your company. Another popular site is LinkedIn. Think of this as Facebook for business people. LinkedIn is largely free to use (there’s a small added fee if you want to make more than a few contacts each month). With LinkedIn the object is purely business networking. There is a minimal amount of messaging or posting of photos. To get started you update your profile with past work history, school history and a more professional summary of your biography. Other users can post recommendations about you (and you can post them about your contacts). Think of this as a high tech reference letter! Most of the users on LinkedIn are there to develop leads for jobs or search for employees. 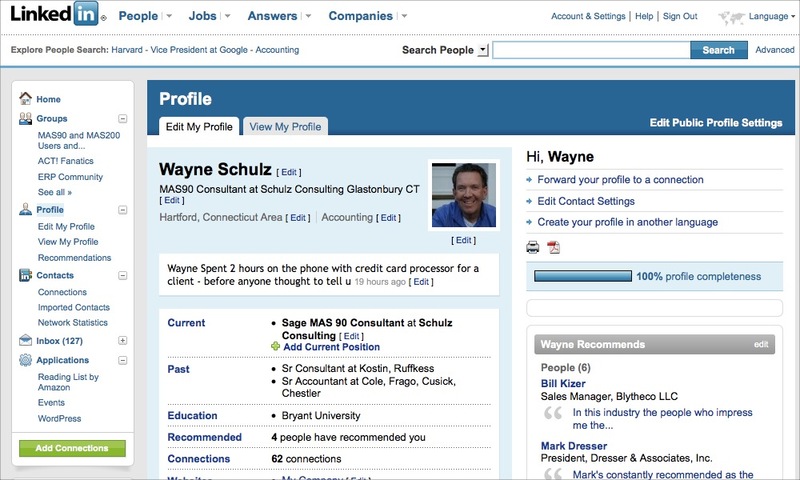 When you form connections with other people on the service (this is where the LinkedIn name comes from) you can ask them to introduce you to their contacts should you need to make an inquiry for a job or for potential client. Twitter – what is it and why would anyone care what I am doing? The last social media tool that’s gathering some “buzz” is a very simple and basic service called Twitter. There’s only one thing that Twitter does — it allows you to post brief (140 character maximum) messages that answer the question “what am I doing”. Often these messages describe what you are doing at the moment though you often will see people posting open questions on a wide variety of topics. The appeal of Twitter is that it integrates to a huge number of different online services. By sending a message to my Twitter account — I can also update my Facebook profile at the same time. So Twitter becomes an easy way to generate multiple sites with short content (also known as status messages or “what am I doing”). Twitter also accepts text messages sent from your phone (thus the limit of 140 characters which is generally the maximum size for text messages). The question that I hope you are asking is — “Do people really care what I’m doing” followed by “This sounds weird and like a waste of time”. 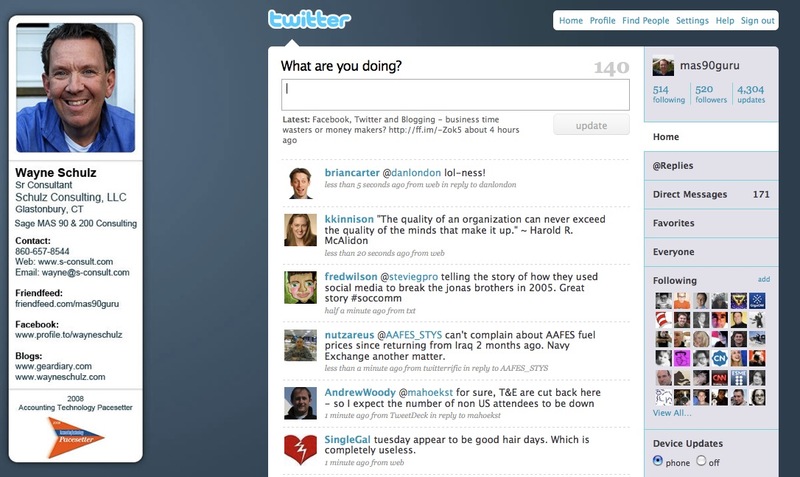 At this point the main users of Twitter seem to be those who either work at home and are networking in a manner similar to the “office water cooler” or writers who use the service to gather information on things that are currently happening (which is easy because there are several tools that integrate to Twitter and display the hottest keywords being sent by users at any time). There are several ways you can use Twitter for business. 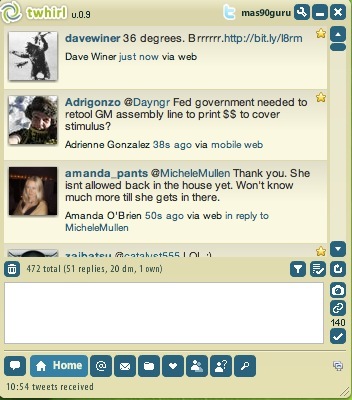 First, there are tools (my favorite is a program called Twhirl – http://www.twhirl.org) that make it easier to not only post messages but to listen. 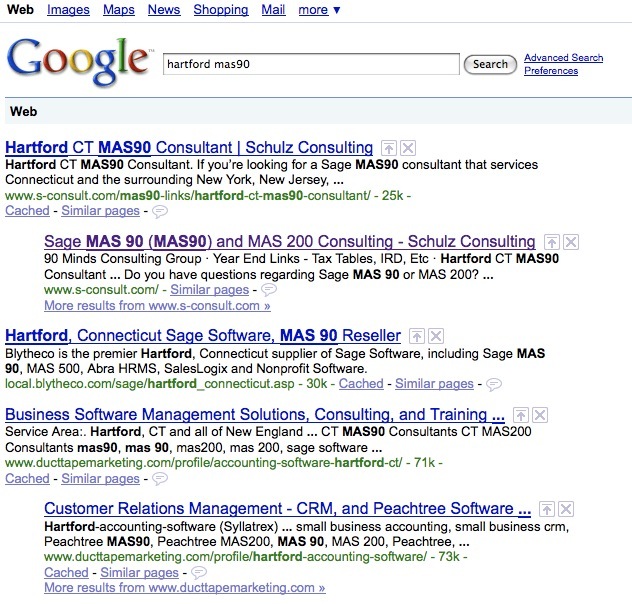 Using this software tool I’ve setup my searches so that anytime someone mentions MAS90 or Sage Software (my specialties) that I’m able to see them right away. Often I will provide (free) answers to a question about these products. While it might seem foolish to provide a free answer, long term the hope is that your company builds a relationship with the user and perhaps a customer. Twitter is still very much in the early adopter stage. It is gathering press mentions because of the easy way that it allows news to spread quickly. When the airplane went down in the Hudson River, Twitter was one of the first services that carried messages and photos from people in New York City announcing that a plane had crash landed. Social Media is still not used by everyone. Just as the notion of web sites was foreign to most of us 20 years ago, the notion of Social Media seems foreign today. Your firm should make some effort to become familiar with the various tools and establish a basic presence (Facebook, LinkedIn, Blog). By becoming familiar at the early stage of use, you’ll be better poised to increase the amount of time that you spend on various Social Media sites as they become used by more of our typical business customers. In 1986 I remember the CPA firm I worked at (Cole, Frago, Cusick & Chestler) bought their first fax machine. Actually at the time faxes were so expensive that they leased it! The technology of using a fax seems mysterious. Hardly anyone used the machine at first. Gradually as people grew accustomed to faxing it became an indispensable part of the business office. As your older clients retire they’ll hand over the “keys to the business” to their children. These children have come through school learning how to use tools like Facebook as their primary communication method. If companies want to form connections with this next generation of business owner, they must learn their language! Social Media is increasingly the language of this next generation. It’s time for you to learn this new language. Exactly. And it all has to come to the email application of the users and not remain on a plethora of websites that have to be logged into. To that end, you might want to give http://www.senderok.com a try and see its potential in terms of identifying those who are writing to you and/or putting a face to them. Honestly, I forget to keep in touch with people if they don't have facebook. Or I forget to invite them to events if they don't have a facebook account. Because if I'm planning a group trip, I'll set up an event on facebook, and then just scroll through my contact list to help me think of who would be interested in coming. Social media's are money making business. But some of the people can use it for waste of time. Thanks for sharing it. Good points, especially how older people who didn't even grow up with a computer need to step up and get comfortable with social media. The buzz us already deafening.